Under the Victorian government’s Public Housing Renewal Program, 70% or more of public land is to be sold to private developers for “redevelopment” (= private profit). All the public housing properties will be demolished. There will be a slight increase (10%) in so-called “social housing”, built to replace the public housing, but these dwellings will be smaller and mainly 1 or 2 bedroom units – so the actual capacity to house people in need is likely to be reduced. Furthermore, it is doubtful whether this will be true public housing or the privatised version of “community housing” (aka social housing), which is either owned or managed by separate businesses with their own policies and procedures. Essentially this represents a gross privatisation of what are presently 100% public assets. For more than one year, thousands of public housing tenants have been living under the threat of loss of their dwellings. Similar schemes are apparently also being implemented in other states. Besides the fundamental problems behind this plan, there appears to be some associated misjudgments and unwarranted assumptions. The most obvious basic problem is the policy that the government itself does not need to solve the public housing crisis of insufficiency and dilapidation. One error of judgment is that the problems of public housing can be solved by private enterprise. If the privately owned real estate industry is so good at meeting the needs of the disadvantaged, why do we have such a housing crisis now? In Victoria, free kicks have been provided to land acquirers and real estate speculators for the past 180 years. Now we have a housing shortage that is arguably as bad as it has ever been. Proof of this is the unacceptable number of people who have been on the public housing waiting list for more than a decade, out of a current total of 35,000 people on public housing waiting lists. The plain truth is that the private rental real estate market is devoted to profit – profit that is not to be made in sufficient amounts from the poor and needy. So, the plan is to obtain cheap public land, demolish the existing housing stock, and rebuild with units that can be sold for profit. The problems are twofold: firstly, that cheap land is already inhabited by public housing residents; secondly, those public housing tenants will not be able to supply the necessary profit – so to satisfy social needs the redevelopers must be compelled to accommodate the displaced public housing tenants. This presents an irreconcilable conflict of interest. The redevelopers have obviously lobbied the Victorian government successfully, as the conditions of their permits are favourable to their profiteering incentives. They only need to provide a percentage of their total redevelopments to “social housing”, not necessarily even public housing. Across Melbourne there are nine freestanding public housing estates that are planned for “redevelopment”: in Ascot Vale, Brighton, Brunswick West. North Melbourne, Heidelberg West, Hawthorn, Northcote, Clifton Hill and Prahran. There are also two areas of low-rise public housing attached to high rises in Flemington and Prahran that are also targeted, making a total of 11. The damning ratio of the outcomes planned for these estates is that only 188 new “social housing” dwellings will be built compared with a massive 4,521 private units. It appears that the decisions leading to this crisis have been made behind closed doors and in the absence of meaningful consultation with the people who will be affected. Associated assumptions are that it is acceptable to disrupt the lives of those public housing tenants and that private developers will provide the necessary properties to accommodate the displaced residents. This seems like a pointless exercise: evict the tenants, knock down their homes, allow the buyers to build new residences and rehouse the tenants. It is not that simple. Of course the devil is in the detail and not all of the evicted residents will be able to return. Bad luck for those who miss out. In order to implement this flawed policy, the language has been twisted and euphemised. As stated, the system has been split up under the umbrella term “social housing”. In addition to public housing there is a new category called “community housing”, which is not necessarily publicly owned. Only public housing is both owned and managed by the government. This enables a change (= increase) in the scale of rent levels chargeable. With rental charges proportional to income under public housing, tenants only pay 25% of their income – but under these new classifications, rents increase to 30% or more. Another loss is the public housing flexible rebated rents that rise and fall depending on changes in circumstances, a protection which ensures that low-income earners are securely housed. This protection is likely to be withdrawn from tenants in community housing. The term “social housing” enables dependent tenants to be further marginalised and to become another source of profit for the corporatised, non-profit/charitable sector to venture into the housing market. This is an innovative development. Another innovation is the refusal to admit that current residents will be evicted; the official term is “relocated”. Regardless of the terminology, when those tenants cannot be told where they are then to be housed, it looks remarkably like eviction. It is hard to escape the conclusion that the crisis facing the capitalist system has resulted in terminal desperation. In an already crowded city this system cannot continue to generate its expected profit levels if it must pay the increasingly exorbitant real estate prices that it has caused. This system is functioning so well that its opportunities now arise in alienating public lands (currently serving socially worthwhile purposes) so that private enterprise can profit from the exploitation of poor, marginalised and vulnerable people. It seems to be an increasingly cruel and rapacious system, desperately casting around for novel ways to exploit diminishing untapped economic potential – regardless of the social costs of its efforts. 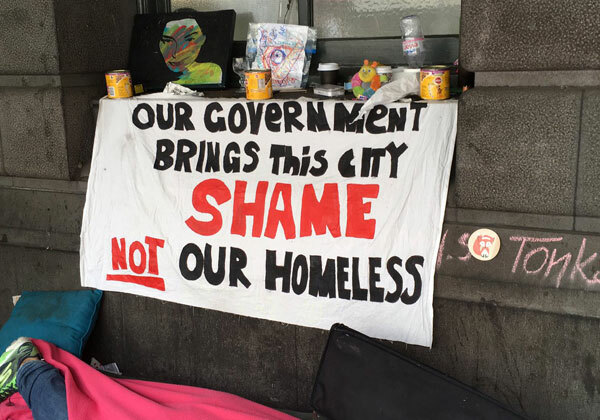 The casualties of this system will be the abandoned residents of the currently existing public housing estates, displaced to make way for the gentrification of those neighbourhoods. If some of them are lucky enough to have employment now, how will they be affected if they are “relocated” to great distances from their current residences? What if these changes result in their commuting costs exceeding the monetary benefits of their employment? How will they manage childcare and the schooling of their children, not to mention whatever social and family networks they may have? What choices will they have in the destinations of their “relocation”? The proposed scheme gives the tenants a “choice” of preferred relocation areas, but if there is nothing available in those areas, they may be made to relocate anywhere or they will have to enter the private real estate rental market. Those “relocated” will pay the same rent as for their current premises. This sounds remarkably like public subsidies for the private rental market, if private rents are to be capped at public housing levels. Is it believable that in an understocked market, private landlords will rent their properties at a loss to displaced public housing tenants? However, implicit in the government’s printed advice is the recognition that not all the affected tenants will return to their present sites; and those permanently “relocated” will have their rents capped at current rates for the first six months only. What then? One of the benefits of public housing was security of tenure, and this is of vital importance for those whose circumstances cannot afford the cost and inconvenience of moving house. The competition for rental properties is intense. Stories abound of people with comfortable salaries spending large amounts of time in vain searches. Below them on the economic scale are students and the underemployed; their choices are more limited and they find it even more difficult to find rental accommodation, and all tenants now have little security of tenure on their temporary homes. Regularly being moved on is a way of life for them. Those closer to the bottom of the ladder of opportunity have even less hope. Their only possibilities lie in public housing, for which the waiting lists are long, and of which there is soon to be much less available. In this situation of a housing shortage, where/how is the government going to find the means of accommodating several thousand further displaced tenants? Complicating this difficult situation is the sad reality that not one item of public housing stock has been added to the state-owned inventory in the last two decades. We are about to pay the heavy price of the outsourcing of government responsibilities so recklessly and foolishly implemented by the vandalistic Kennett and his gangster administration in the 1990s. So now the long queues for inadequate public housing are to be further lengthened by those unfortunately “relocated” so that their existing publicly owned homes can be demolished. It is hard to identify any sanity in this scheme.